Simple beginner projects lead to show off-worthy results with Megan Mussari's embroidery kit. Needle and thread may well become your favorite art tools once you take a stab—actually, a stitch—at embroidery with Megan Mussari's beginner's DIY kit. Decorate a favorite denim jacket, make patches or bookmarks, or create unique, embroidery wall hangings. Simple projects, using the decidedly non-traditional designs provided, lead to show off-worthy results. 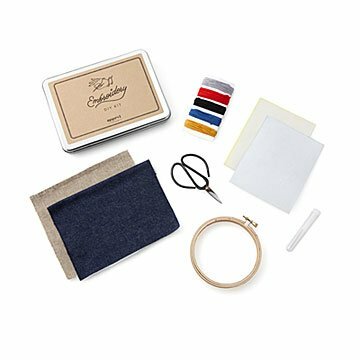 Everything needed to learn basic stitches comes inside a neat tin box: recycled denim and linen patches, and high-quality embroidery tools, floss, thread, and a hoop. Components made in China and Thailand. Assembled in New York City. Through her intuitive curiosity in natural dyes and desire to make quality products by hand, and a background in the fashion and textiles industry, Megan saw and felt firsthand the harsh effects of synthetic dyes in mass production. In an effort to find friendlier alternatives, her studies and explorations in natural dyeing began. Following these endeavors, Megan was able to focus on the Japanese tradition of Shibori indigo dyeing. These methods provide structure while also allowing for experimentation in an effort to broaden knowledge, skills and inspirations. From Megan's artist studio in Brooklyn, New York, she is on a constant search and exploration inspired by natural movements. By embracing the beauty of human error within the dyeing process,each design is truly one of a kind.